Here's a fun one, just because it exudes excitement and motion. 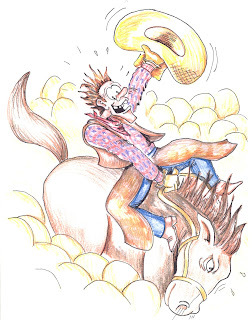 Besides, cowboys are just plain fun to draw!! This is from my '95 calendar, "Welcome to Oregon". It featured fun things to do or watch throughout the state of Oregon . This drawing represented the Pendleton Roundup, which has gotten to be quite the event, attracting pro rodeo cowboys from all over the country. I haven't been to see it yet, but have heard that it is really fun. Hopefully I will get to see it b.i.d. (before I die).